He had much to be furious about at the turn of the 17th century. The ever-changing constitutional question gave Ireland and England the same king – which meant government then – but two kingdoms. The English used that difference to try to kill any Irish products which competed with theirs, even in overseas trade. Swift’s call for retaliation – “Burn everything English, except their coal” – may be his best-known quotation, in Ireland at least. We have not heard it used much this time, although it was the popular mantra during the Anglo-Irish “economic war” of 1932. The Anglo-Irish “war” was not about trade either. It was about who should pay compensation to landlords for the compulsory purchase of their estates in the 19th century, but it ended up in trade retaliation, especially on agriculture. If the UK should leave with no deal and end up under World Trade Organisation (WTO) rules, it would not be because a trade war has erupted between Britain and the EU. But the effect would be the same. Elsewhere in the world, trade is again dangerous politically. Those 17th century English merchants may have been unkind, but they were using what seems like common sense – protecting their business against foreign competition. 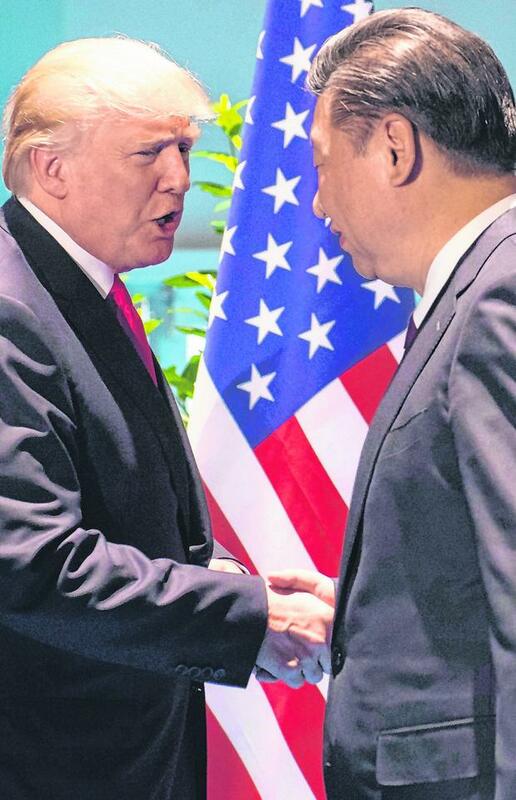 Today, Donald Trump and Xi Jinping would agree with them, one openly and the other surreptitiously. Standard economic theory holds that, on this at least, common sense is misleading. Overall, it says, we are better off if trade is not restricted by tariffs, quotas and regulations. In its new World Economic Outlook, IMF analysts cite both technology and open trade for the startling statistic that a computer which cost $30,000 in 1984 would cost $300 today. The EU has applied these ideas to a unique degree with the creation of the customs union and single market – although it was inspired by much more than free trade theory. The consequences are the same though, whatever the motivation. Some of them overturn common sense a bit too. The controversially topical speech by President Michael D Higgins on the nature of the EU is a product of this. Like many others, he sees a bias in favour of business and finance in the make-up of the EU. He seems to regard this as a deliberate choice, inspired by the power of money. Some of it undoubtedly is, but much else is unavoidable. One cannot have free markets without a lot of freedom for business, or have free movement of workers without some freedom for employers to hire and fire. The EU’s system for keeping markets open and fair throughout the union is well tried and tested. But turn the glass one way, and it looks like rampant capitalism which knows no frontiers. Turned the other way, there is a great Brussels bureaucracy stifling enterprise. One of the many strange things about the UK debate is that there have been relatively few direct attacks on the EU system itself. It has been more a case of whether Britain needs Europe more than Europe needs Britain. The most the Leave campaign can come up with is that Britain will do better outside the EU, rather than a ridiculous claim that is has been positively harmed by membership of the single market. Outside Europe, 17th century common sense is re-asserting itself. Free trade is increasingly seen as foreigners taking advantage of one’s generosity. The old slogans of buying less abroad and making more at home are back in vogue. Those slogans had their heyday in the 1930s and into the 1950s. Since then, freeing up trade has been one of the great agents of change. That computer price is just an extreme example of what the IMF analysts say is a 60pc fall in the price of machinery and equipment relative to the overall cost of consumption in the past 30 years. They believe that trade integration – in particular the growth of multi-national supply chains – has been the biggest factor behind the falling prices. The extraordinary integration of the EU has been laid bare by the attempted Brexit dis-integration, but the same process has been at work everywhere. The arguments over the effects of free trade and globalisation often miss one important point – that they have been of enormous advantage to those on lower incomes. In rich countries, the dramatic fall in the real prices of manufactured goods, from baby buggies to high-definition televisions, has been a major boost to living standards. In developing economies, especially in Asia, the effects have been even more dramatic. Tens of millions have moved from near-starvation subsistence levels based on agriculture to western standards of prosperity. There may be more to it than redundant industrial workers. The market power of large companies has increased, not diminished, as proponents of open trade hoped would happen through greater competition. The big tech companies are the obvious example, but at least they have certain unique characteristics. Market concentration is evident in other sectors too, on a scale great enough to worry central bankers because it may make interest rate policy less effective. Market power may also reduce the effectiveness of the mano a mano trade policies favoured by President Trump. A comprehensive study in the IMF report looks at the effect of tariffs imposed by one country on the goods of another since 1990. It finds that, while tariffs may affect the bilateral trade balance, it does not change the overall balance of the country in question. Companies simply shift their supply lines elsewhere to avoid the new duties. That’s the balance, but the volume of trade may indeed fall. In its new report, the WTO reduced its estimate for growth in world trade last year by a third, to 3pc. Its forecast range for this year is from a low of 1.3pc to a high of 4pc, with the risks tilted towards the lower end. Trade tensions, especially between the USA and China, get the major part of the blame. European attitudes to Chinese policies are also hardening. If these trends continue, multinational firms may find supply chains too widely disrupted to let them overcome restrictions as readily as they did in the past 30 years, when markets in general were becoming more open rather than closed. The EU needs to think about these issues when it comes to its own internal affairs. The single market, and even more the single currency, tend to disguise the imbalances between member states and keep them out of the political debates. Actions since the euro crisis have reduced those imbalances through changes in domestic polices, since tariffs are not allowed. According to the IMF analysis, that is more effective anyway. However, they have largely been policies of restricting consumption in the deficit countries rather than improving productivity. That may not be sustainable. It is a great achievement that one EU country cannot deliberately restrict sales from another. It would be an even greater achievement if surplus member states could be persuaded that the others need to be given competitive advantages, as well as creating their own, to enable them sell more. On that basis, perhaps Dean Swift should have said “burn English coal more efficiently” – only he would have found a much better way to say it.